Not quite the response you expect to get when you ask a leading scientist about the current state-of-the-art in all things tunnelling. But Dr Nick McCormick, Principal Research Scientist at the National Physical Laboratory (NPL) wasn’t joking. 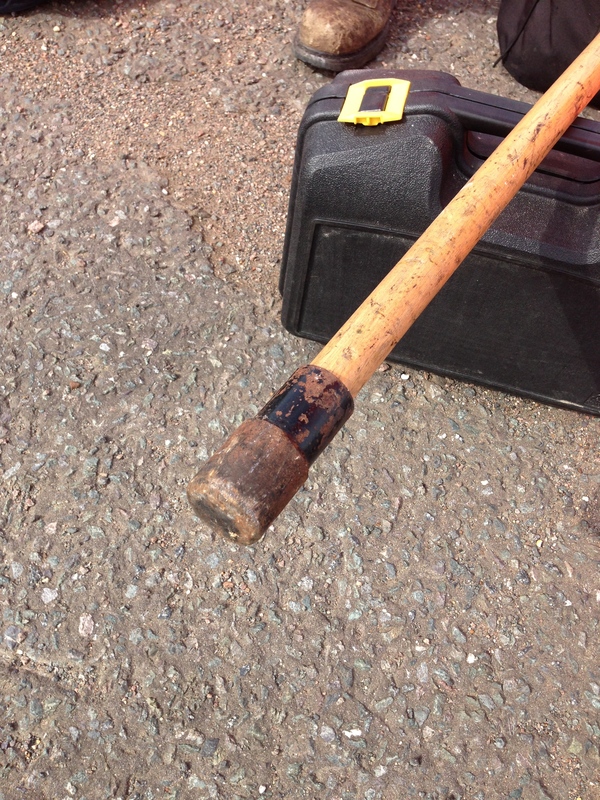 Here is an actual stick used by UK tunnel inspectors…. I think it’s safe to say that it’s probably not the most scientific way to check the structural integrity of a tunnel. But right now, tunnel examination in the UK, and in many other countries, relies almost entirely on tactile and visual inspection techniques. Individual inspectors walk through the tunnel in the dead of night (when the tracks are free of trains), armed with sticks and torches. They then check for any suspicious-looking cracks or bulges in the fabric of the tunnel, tapping anything that seems troublesome with the stick. They log the position of issues that can’t be easily fixed for further repair. Six months later, they walk through the same tunnel again, and look for any changes to the tunnel. There is absolutely no doubt that these inspectors are highly-skilled, experienced and that they do their very best to identify any potential problems. But they’re being asked to carry out an impossible task. Say an inspector identifies a bulge in a section of the tunnel. How can they repeat exactly the same ‘analysis’, from the same angle, under the same illumination, six months later? They can’t. The reality is that the rail sector have always been incredibly conservative. For a long time in civil engineering, innovation was treated like a dirty word. But according to McCormick, the ever-growing scale of infrastructure projects (e.g. Crossrail) is beginning to change that. New ideas are now being welcomed by the rail sector, making scientists and engineers very happy indeed. And this is why I recently spent the morning at (my alma mater) NPL. I wanted to talk to McCormick about his DIFCAM (digital imaging for condition asset management) system, developed with Atkins and Omnicom, for examination of the interior of rail tunnels. In its simplest form, DIFCAM is a Land Rover loaded with cameras, but there’s much more to it than that. 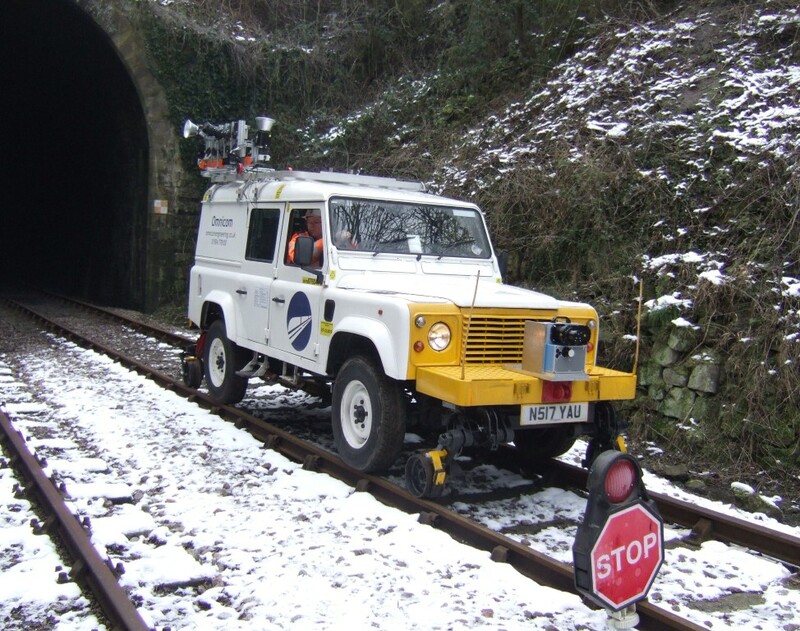 First off, the LandRover also has guidewheels, so it can safely travel through tunnels. [Fact: in order to get onto the rails, it has to drive onto a level crossing and then deploy its guidewheels. Yes, really]. On board the beastie is an array of high resolution SLR cameras – 11 in total (10 that image the tunnel and one that points down to face the track) all supported by a big aluminium frame. There are also four flashes on board, which together illuminate the entire tunnel. On the front of the vehicle you’ll find a laser scanner that rotates at 200Hz, (200 times every second). 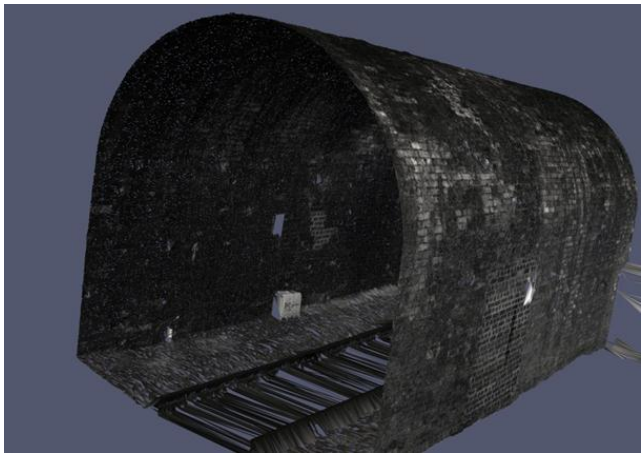 Its job is to continuously scan the tunnel, building up an image of the shape. The vehicle travels along at 1m/s. Because the cameras are precisely synched, every metre, all 11 take an image of the illuminated tunnel. When combined with the laser images of the tunnel’s shape, the entire tunnel can be recreated, with sub-millimetre resolution. So, we can take cool images of the tunnel, now what? Well, while that definitely gives more information than a traditional ‘walkthrough’, for DIFCAM, it’s only the start. The main feature of the DIFCAM system is that it can do a comparison of one measurement run with another, taken months or years apart. So if an inspection of the tunnel is carried out in January and then again the next January, DIFCAM will allow inspectors to correlate the images from both runs. And it automatically identifies any changes or movement in the tunnel wall appearance, i.e. it can tell you how much that crack has grown in 12 months. The tunnel inspectors can then use their skill and judgement to make a decision on that defect – does it need to be repaired? And if so, how soon? Far from taking the job away from a tunnel inspector (often a criticism! ), this system could provide more information for them, so that they can do their job more efficiently. Anyway, back to how it works. 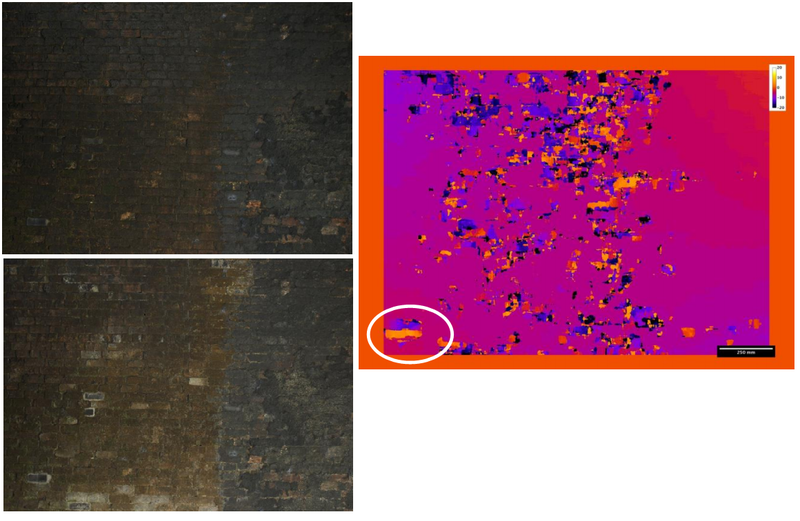 To compare images taken years apart, you use a process called Digital Image Correlation (DIC). You select an identifying feature in the first image – it might be a particularly oddly-shaped crack. You then compare it to how it looks in the image taken a year later – if the crack hasn’t grown or changed shape or location, you can be confident that (at least that portion of) the tunnel is stable. But it relies on knowing that the images are taken from exactly the same place – only then can you know that you are comparing like with like. That’s all well and good on a lab bench, but in a tunnel it’s a little trickier. So they use GPS to define their location, right? Wrong. A rarely-mentioned factoid is that GPS does not work underground. Instead the NPL team designed their own tachometer / odometer (a device similar to that found in your car, which measures distance by knowing the circumference of the wheel). Despite its simplicity, it is accurate to 20mm in about 500 m.
Anyway, as I said, the really cool thing about DIC is that it does this comparison automatically. Thanks to some clever data stamping and analysis, it displays only the areas that have changed between images. In the example below, there are clear difference between the two optical images. But the tutti-frutti-coloured DIC image shows the differences exceptionally well – where you see pink, there has been no change between inspections (i.e. the tunnel is stable). Where you see any other colour (e.g. purple or black) there has been a marked change in the shape and structure of the tunnel (the colour is on a scale of displacement). The images on the left were taken just four months apart. So, in a very, very real way, this system will change the way we look after our tunnels. Given that it would be utterly uneconomic to replace them (can you imagine the chaos if London Underground tunnels needed to be replaced?! ), they need to be maintained, to the absolute best of our ability. …….The stick is dead. Long live DIFCAM!